Hmong Americans at a community recycling event in Saint Paul, Minnesota. The Hmong people are a major ethnic group in the Minneapolis–Saint Paul area. As of 2000 there were 40,707 ethnic Hmong in the Minneapolis-St. Paul area. The 2010 U.S. Census stated there were 66,000 ethnic Hmong in Minneapolis-St. Paul, giving it the largest urban Hmong population in the world. Grit Grigoleit, author of "Coming Home? The Integration of Hmong Refugees from Wat Tham Krabok, Thailand, into American Society," wrote that the Minneapolis-St. Paul area "acted as the cultural and socio-political center of Hmong life in the U.S."
The Hmong, who were refugees, settled in Minnesota due to the actions of voluntary agencies (VOLAGS). Minnesota had many active VOLAGS who helped Hmong people when they arrived. The University of Minnesota Agricultural Extension Services and the Lao Family Community established farming programs for Hmong in the early 1980s. The programs ended in 1985. In 2004 Randy Kelly, the mayor of St. Paul, traveled to Thailand with a delegation of professionals and educators, most of them Hmong, to assess a community of Hmong refugees. As of 2006, the Minneapolis-St. Paul area was expected to receive Hmong refugees from Wat Tham Krabok in Thailand. The 2011 American Community Survey report stated that 31% of Hmong in the State of Minnesota were considered to be in poverty. According to the 2000 U.S. Census data 33% of Hmong people in Minnesota were considered to be in poverty. According to the 1990 U.S. Census data 65% of Hmong people in Minnesota were considered to be in poverty. Around 2013 Mai M. Na Lee, the author of an encyclopedia article titled "Hmong of Minnesota and California," wrote that despite a lack of official statistics, "there are reputedly many Hmong millionaires in the Twin Cities." As of 2013 over 50% of Minneapolis area Hmong own their own houses. As of around 2013 the Hmong businesses in the Minneapolis-St. Paul area had revenues of over $100 million total. As of 2011 several Hmong-owned businesses are located along West University Avenue in St. Paul. Hmong Village, a complex with 250 merchant stalls and 20 restaurants, opened in 2009. Nine businesspeople had developed the complex. In 2012 McDonald's introduced its first Hmong language advertising in the United States at a restaurant in Minneapolis. However it was unintelligible to Hmong speakers. A recycling sign in Minnesota with instructions in Hmong and other languages. As of around 2013 there were about ten Hmong nonprofit organizations in St. Paul. The largest Hmong nonprofit group in the State of Minnesota is the Hmong American Partnership (HAP), headquartered in St. Paul. 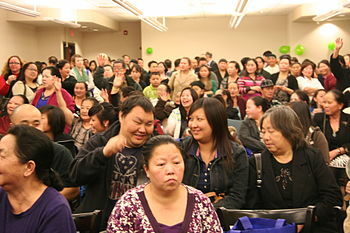 The Lao Family Community, headquartered in St. Paul, is the most established and oldest Hmong organization. Younger leaders began to leave the organization in the 1990s as a result of political disagreements. Mai M. Na Lee wrote that the organization "continues to monopolize festival events like the New Year's Festival and the Fourth of July Soccer Tournament." She added that it is "not without scandal." The Center for Hmong Arts and Talents (CHAT), based in St. Paul, develops Hmong art and literature. The Hmong Cultural Center is also in St. Paul. When Choua Lee began serving as a member of the board of education of Saint Paul Public Schools in 1991, she became the first Hmong-American elected to public office in the area. The second official, Neal Thao, took Choua Lee's position in 1995. Neal Thao remained in this seat for seven years. In 2000, Dr. Aly Xiong, a human rights activist and school principal, was the first Hmong-American to run for a Minnesota State Legislative seat, District 67B. He lost to State Respresentative Sheldon Johnson, who served the east side of St. Paul for 20 years. The Hmong Veteran's Naturalization Act of 2000 increased the number of Hmong eligible to vote, giving them more political power. In 2002, Cy Thao was elected to the Minnesota House of Representatives for District 65A and Mee Moua was elected to the Minnesota Senate for District 67. The third Hmong-American to be elected to the St. Paul school board, Kazoua Kong-Thao, elected in 2003. Mee Moua's sister, Vallay Moua Varro, was elected to the St. Paul school board in 2009. This was the first time that two Hmong officials served concurrently on the St. Paul school board, since Kong-Thao was still in office. In 2013 Dai Thao defeated Kazoua Kong-Thao and six other candidates in a special election to become the first St. Paul City Councilmember of Hmong descent. Mai M. Na Lee wrote circa 2013 that the Hmong have a significant political influence in St. Paul due to the size of the population. Beginning around 2000 Minnesotans campaigning for office have visited Hmong events to get the Hmong vote. The Hmong Today and Hmong Times, two Hmong newspapers, are headquartered in the Minneapolis area. As of 2000 24% of Minnesota Hmong graduated high school or an equivalent, eight percent had a bachelor's degree and/or an associate degree, one percent had a master's degree or further education. Fifty-three percent of Hmong in Minnesota had never had education. As of 2010 the State of Minnesota had 22,000 students of Hmong origins. Minneapolis Public Schools and St. Paul Public Schools have large concentrations of Hmong students. Minneapolis Public Schools operates the Hmong International Academy, a PreK-8 school catering to the Hmong community. In addition the Hmong College Prep Academy is a K-12 charter school in Saint Paul. There is also the Hope Community Academy, a K-8 school located in Saint Paul that is open to all students but has a focus on Hmong language and culture. By 2011 increasing numbers of Hmong were attending universities and colleges. Many Hmong student associations formed on area university and college campuses. The Hmong New Year is celebrated in the metropolitan area. The 38th annual Hmong New Year in St. Paul was held in 2013. Due to the farming programs established in the 1980s, many Minnesota Hmong had gained an interest in farming and agriculture. The film Gran Torino by Clint Eastwood, though filmed in Michigan, stars five Minnesotan Hmong Americans and the original story was based on a neighborhood in Minneapolis. It was the first mainstream U.S. film to feature Hmong Americans. Cy Thao (Minnesota state representative) - He was elected in 2002. Foung Hawj (Minnesota state senator) - He was elected in 2012. Tou Xiong was elected in Nov. 2015 as first Hmong American City Council member in Maplewood, Minnesota. MayKao Y. Hang serves as the president of the Wilder Foundation. ^ Pfeifer, p. 259. "Minneapolis-St. Paul claimed 40,707 Hmong residents." ^ a b Staff report. "St. Paul: Annual Hmong New Year celebration begins today." Twin Cities Pioneer Press. November 27, 2013. Retrieved on January 17, 2014. ^ a b Grigoleit, p. 2. ^ "Good Question: Why Did Somalis Locate Here?" () WCCO-TV CBS Minnesota. January 19, 2011. Retrieved on January 18, 2014. "It’s the same reason this is a population center for Hmong refugees. The VOLAGS make the initial wave happen." ^ a b c d e Lee, Mai M. Na, p. 507. ^ a b c Lor, Yang, p. 2. ^ a b c d e f g Shah, Allie. "Settled after 35 years, Hmong must decide: What's next?" Minneapolis StarTribune. April 22, 2011. Retrieved on January 18, 2014. ^ a b c d e f g h i j k l m Lee, Mai M. Na, p. 508. ^ Melo, Frederick. "St. Paul: McDonald's Hmong pitch mangles language." Twin Cities Pioneer Press. September 2, 2012. Updated on September 3, 2012. Retrieved on May 10, 2013. ^ Xiong, Yang Sao. "Education of Hmong Americans." In: Banks, James A. (editor). Encyclopedia of Diversity in Education. SAGE Publications, May 24, 2012. ISBN 1412981530, 9781412981538. p. 1078. ^ "Home." Hmong International Academy. Retrieved on January 18, 2014. ^ "District." Hmong College Prep Academy. Retrieved on January 18, 2014. ^ "HOPE Community Academy". HOPE Community Academy. Retrieved 2017-01-29. ^ Lee, Gary Yia and Nicholas Tapp. Culture and Customs of the Hmong. Greenwood Publishing Group. ABC-CLIO, 2010. 76-77. Retrieved from Google Books on April 14, 2012. ISBN 0-313-34526-0, ISBN 978-0-313-34526-5. ^ Yuen, Laura. "Hmong get a mixed debut in new Eastwood film." Minnesota Public Radio. December 18, 2008. Retrieved on March 18, 2012. ^ Orrick, Dave. "State Sen. Mee Moua lives darker side of American dream, loses her home." Twin Cities Pioneer Press. September 17, 2010. Retrieved on January 17, 2014. ^ Koumpilova, Mila. "St. Paul's First Hmong city council member, Dai Thao, sworn in." Twin Cities Pioneer Press. November 21, 2013. Retrieved on January 17, 2014. ^ Vang, Bee (7 April 2011). "Opinion: Why I can't shrug off KDWB's hateful slur against Hmong community". St. Paul Pioneer Press. Retrieved 7 April 2011. ^ Xamoua. ""Gran Torino" interview with Bee Vang." Hmong Today at Twin Cities Daily Planet. January 27, 2009. Retrieved on March 14, 2012. Grigoleit, Grit, M.A. (Department of American Studies, University of Passau). "Coming Home? The Integration of Hmong Refugees from Wat Tham Krabok, Thailand, into American Society" (Archive). Hmong Studies Journal. Volume 7, 2006. p. 1-22. Lee, Mai M. Na. "Hmong of Minnesota and California." In: Zhao, Xiaojian and Edward J.W. Park, PH.D. Asian Americans: An Encyclopedia of Social, Cultural, Economic, and Political History [3 volumes]: An Encyclopedia of Social, Cultural, Economic, and Political History (Google eBook). ABC-CLIO, November 30, 2013. ISBN 1598842404, 9781598842401. Pfeifer, Mark E. (Hmong Cultural Center, St. Paul, Minnesota). "Hmong and Cambodians." In: R. L. Cayton, Andrew, Richard Sisson, and Chris Zacher (editors). The American Midwest: An Interpretive Encyclopedia. Indiana University Press, November 8, 2006. ISBN 0253003490, 9780253003492. Ngo, Bic, Martha Bigelow, and Kyla Wahlstrom (all from the University of Minnesota). "The Transition of Wat Tham Krabok Hmong Children to Saint Paul Public Schools: Perspectives of Teachers, Principals, and Hmong Parents" (Archive). Hmong Studies Journal. Volume 8, p. 1-35. This page was last edited on 14 March 2019, at 19:20 (UTC).